© Altinoluk etal. ; Licensee Bentham Open. Double logarithms resummation has been much studied in inclusive as well as exclusive processes. The Sudakov mechanism has often be the crucial tool to exponentiate potentially large contributions to amplitudes or crosssections near phase-space boundaries. We report on a recent work where a very different pattern emerges : the DVCS quark coefficient function Cq (x,ξ) develops near the particular point x =ξ a non-alternate series in asnlog2nx–ξ which may be resummed in a cosh kaslogx–ξ factor. This result is at odds with the known result for the corresponding coefficient function for the pion transition form factor near the end point Cq (z) although they are much related through a Cq(Z) correspondence. Keywords: Collinear gluon radiation, DVCS, quark coefficient function, resummation, semi-eikonal approximation, soft gluon radiation.. While perturbative calculations are widely used in quantum field theory, their summation is always a formidable task, unreachable but in the simplest, not to say most simplistic, occurences. >From elementary particle to atomic and to solid state physics, resummation techniques have been developed to go beyond a fixed order perturbation estimate through the sampling and evaluation of an infinite class of diagrams shown to dominate in a limited kinematical region for some given observables. The result of such procedures is often an exponentiated factor as in the famous Sudakov case , exp(-Kg2log2z) where g is the coupling constant and z is the ratio of two different characteristic scales, which governs both QED and QCD calculations of exclusive form factors. As explained in detail in  we obtain for a specific case of exclusive scattering amplitude, namely the deeply virtual Compton scattering in the generalized cosh(kg log z) orken regime, a very different resummed result of the form cosh(kg log z) where z is a momentum fraction. To our knowledge, this form never previously emerged in field theoretic calculations. The process that we focus on is the most studied case of a class of reactions - exclusive hard hadronic processes - which are under intense experimental investigation. The result presented here provides an important stepping-stone for further developments enabling a consistent extraction of the quantities describing the 3-dimensional structure of the proton. with a large virtuality q2=-Q2, factorizes in terms of perturbatively calculable coefficient functions Cx,ξ,α s and GPDs H(x,ξ,t), where the scaling variable in the generalized Bjorken limit is the skewness ξ defined as ξ=Q2p+p'.q+q'.The calculation of first order perturbative corrections to the partonic amplitude has shown that terms of order log2x±ξx±ξ play an important role in the region of small (x±ξ) i.e. in the vicinity of the boundary between the domains where the QCD evolution equations of GPDs take distinct forms (the so-called ERBL and DGLAP domains). We scrutinize these regions and demonstrate that they are dominated by soft fermion and gluon propagation. This explains why they can be exponentiated using quasi-eikonal techniques. The first (resp. second) terms in Eqs. (4) and (5) correspond to the s-channel (resp. u-channel) class of diagrams. One goes from the s-channel to the u-channel by the interchange of the photon attachments. Since these two contributions are obtained from one another by a simple (x↔-x) interchange, we now restrict mostly to the discussion of the former class of diagrams. Let us first point out that in the same spirit as for evolution equations, the extraction of the soft-collinear singularities which dominate the amplitude in the limit x → ± ξ is made easier if one uses the light-like gauge p1. A = 0 with p1 = q' We argue (and verified) that in this gauge the amplitude is dominated by ladder-like diagrams. We expand any momentum in the Sudakov basis p1p2, as k=α p1+β p2+k where p2 is the light-cone direction of the two incoming and outgoing partons p12=p22=0,2p1.p2=s=Q22ξ. In this basis, qy∗=p1–2ξp2.. This ordering is related to the fact that the dominant double logarithmic contribution for each loop arises from the region of phase space where both soft and collinear singularities manifest themselves. When x→ξ the left fermionic line is a hard line, from which the gluons are emitted in an eikonal way (which means that these gluons have their all four-components neglected in the vertex w.r.t. the momentum of the emitter), with an ordering in p2 direction and a collinear ordering. For the right fermionic line, eikonal approximation is not valid, since the dominant momentum flow along p2 is from gluon to fermion, nevertheless the collinear approximation can still be applied. When computing the coefficient functions, one faces both UV and IR divergencies. On the one hand, the UV divergencies are taken care of through renormalization, which manifest themselves by a renormalization scale µR dependency. On the other hand, the IR divergencies remain, but factorization proofs at any order for DVCS justify the fact that they can be absorbed inside the generalized parton distributions and result in finite coefficient functions. In our study, we are only interested into finite parts. Thus, using dimensional regularization, in a factorization scheme like MS, any scaleless integral can be safely put to zero although it contains both UV and IR divergencies. Following this line of thought, we can thus safely deal with DVCS on a quark for our resummation purpose. Finally, the issue related to the iε prescription in Eq. (5) is solved by computing the coefficient function in the unphysical region ξ > 1. After analytical continuation to the physical region 0≤ ξ ≤ 1, the final result is then obtained through the shift ξ→ξ-iε. We define Kn as the contribution of a n-loop ladder to the coefficient function. Let us sketch the main steps of the derivation of K1 and then generalize it for Kn. In the limit x → ξ, while the left fermionic line is hard with a large p2 momentum, the gluonic line is soft with respect to the left fermionic line. So we perform soft gluon approximation in the numerator by taking k+x+ξp2→x+ξp2.. The dominant contribution comes from the residue of the gluonic propagator. Thus, the numerator of the on-shell gluon propagator, dµv, is expressed in terms of transverse polarizations, i.e. which is the known result. This is a positive test of the validity of our approximation procedure that we now generalize to the n-rung ladder. The ladder diagrams which contribute in the light-like gauge to the leading asn1n2nxx terms in the perturbative expansion of the DVCS amplitude. The p2 and ᾕ momentum components are indicated. The dashed lines show the dominant momentum flows along the p2 direction. 18 Ri2=–ki2α i(β 1…β ix–ξ)s,S2=–kn2(β 1…β nx–ξ)s.
where the matching condition introduced in one-loop case is extended to n-loops. For several decades the effects of gluons on many high energy processes has been widely studied. Specifically the theory of "Color Glass Condensate" shows that at very high energies the behavior of the scattering amplitudes are dominated by gluons . Recently it was also shown that even at moderate energies, there are significant O(αs) corrections to scattering amplitudes due to gluonic contributions for spacelike and timelike virtual Compton scatterings . With the above mentioned motivations performing a similar resummation procedure for gluon coefficient function of DVCS and TCS would result in a more trustful extraction gluon GPDs. We have demonstrated that resummation of soft-collinear gluon radiation effects can be performed in hard exclusive reactions amplitudes. The resulting formula for coefficient function stabilizes the perturbative expansion, which is crucial for a trustful extraction of GPDs from experimental data. A related expression should emerge in various reactions, such as the crossed case of timelike Compton scattering  and exclusive meson electroproduction. Giving these results, a question should be raised : what is the physics beyond this result, or in other words, why is the Sudakov resummation  familiar to experts of hard exclusive processes not applicable here? An even more precise question may be: how is our analysis compatible with the discussion of soft effects in the pion transition form factor, a quantity which has been much discussed  recently thanks to the experimental results of BABAR and BELLE? Let us stress that the coefficient function of this quantity is identical to the ERBL part of the coefficient function of the DVCS amplitude after a rescaling →x/ξ. Our result thus may be applied to the transition form factor. In , it has been argued that the α slog2(1–z) factor in the one loop expression of the coefficient function had to be understood as the sum of two very distinct terms, one of them exponentiating in a Sudakov form factor. To advocate this fact, the authors allow themselves an excursion outside the colinear factorization framework and use the familiar detour into the coordinate space framework. Our procedure is different and we resum the complete one loop result. In other words, one may ask to the authors of : what happens to the remnant term proportional to α slog2(1–z) If indeed the usual resummation procedure of the transition pion form factor must be revised following our new results, one may ask whether the understanding of the meson form factor  should also be reconsidered. We thank the organisors and the French CEA (IPhT and DSM) for support. This work is supported by the P2IO consortium, the Polish Grant NCN No. DEC-2011/01/B/ ST2/03915, the French grant grant ANR PARTONS (ANR-12-MONU-0008-01), the Joint Research Activity "Study of Strongly Interacting Matter" (HadronPhysics3, Grant Agree-ment no. 283286) under the 7th Framework Programme of the European Community, the European Research Council grant HotLHC ERC-2001- StG-279579, Ministerio de Ciencia e Innovac on of Spain grants FPA2009-06867-E, Consolider-Ingenio 2010 CPAN CSD2007-00042 and FEDER. Sudakov VV. Vertex parts at very high-energies in quantum electrodynamics Sov Phys JETP 1956; 3: 65-71. Altinoluk T, Pire B, Szymanowski L, Wallon S. Resumming soft and collinear contributions in deeply virtual Compton scattering JHEP 2012; 1210: 49-81. (i) Müller D, Robaschik D, Geyer B, Dittes FM, Horesjsi J. Wave functions, evolution equations and evolution kernels from light ray operators of QCD ortsch Phys 1994; 42: 101-41.; (ii) Radyushkin AV. Scaling limit of deeply virtual Compton scattering Phys Lett B 1996; 380: 417-25.; (iii) Ji XD, Osborne J. One loop corrections and all order factorization in deeply virtual Compton scattering Phys Rev D 1998; 58: 94018-39.; (iv) Ji XD, Osborne J. One loop QCD corrections to deeply virtual Compton scattering The Parton helicity independent case Phys Rev D 1998; 57: 1337-40.; (v) Collins J, Freund A. Proof of factorization for deeply virtual Compton scattering in QCD Phys Rev 1999; D59: 74009-19. (i) Goeke K, Polyakov MV, Vanderhaeghen M. Hard exclusive reactions and the structure of hadrons Prog Part Nucl Phys 2001; 47: 401-515.; (ii) Diehl M. Generalized parton distributions Phys Rept 2003; 388: 41-277.; (iii) Belitsky AV, Radyushkin AV. Unraveling hadron structure with generalized parton distributions Phys Rept 2005; 418: 1-387. (i). Belitsky AV, Mueller D. Predictions from conformal algebra for the deeply virtual Compton scattering Phys Lett B 1998; 417: 129-40.; (ii) Belitsky AV, Mueller D, Niedermeier L, Schäfer A. Deeply virtual Compton scattering in next-to-leading order Phys Lett B 2000; 474: 163-9.; (iii) Pire B, Szymanowski L, Wagner J. NLO corrections to timelike, spacelike and double deeply virtual Compton scattering Phys Rev D 2011; 83: 34009-26.; (i). 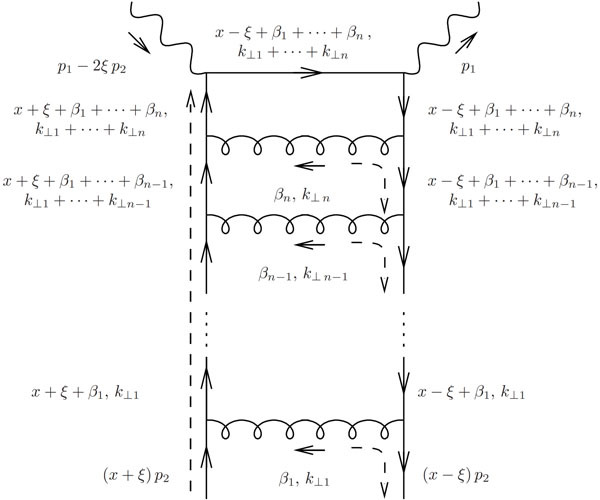 Marian JJ, Kovner A, Leonidov A, Weigert H. The BFKL equation from the Wilson renormalization group Nucl Phys 1997; B504: 415-31.; (ii) rizwan m. The Wilson renormalization group for low x physics towards the high density regime Phys Rev 1999; D59: 14014-27.; (iii) Marian JJ, Kovner A, Weigert H. The Wilson renormalization group for low x physics Gluon evolution at finite parton density Phys Rev 1999; D59: 14015-28.; (iv) Kovner A, Milhano JG. Vector potential versus colour charge density in low-x evolution Phys Rev 2000; D61: 14012-26.; (v) Kovner A, Milhano JG, Weigert H. Relating different approaches to nonlinear QCD evolution at finite gluon density Phys Rev 2000; D62: 114005-45.; (vi) Weigert H. Unitarity at small Bjorken x Nucl Phys 2002; A703: 823-60.; (vii) Iancu E, Leonidov A, McLerran L. Nonlinear gluon evolution in the color glass condensate 1 Nucl Phys 2001; A692: 583-645.; (viii) Iancu E, Leonidov A, McLerran L. The Renormalization group equation for color glass condensate Phys Lett 2001; B510: 133-44.; (ix) Ferreiro E, Iancu E, Leonidov A, McLerran L. Nonlinear gluon evolution in color glass condensate 2 Nucl Phys 2002; A703: 489-538. Moutarde H, Pire B, Sabatie F, Szymanowski L, Wagner J. On timelike and spacelike deeply virtual Compton scattering at next to leading order Phys Rev D87: 054029-. Mueller D, Pire B, Szymanowski L, Wagner J. Timelike and spacelike hard exclusive reactions Phys Rev D 2012; 86: 31502-7. (i) Mueller AH. On the aysmptotic behavior of the sudakov form-factor Phys Rev D 1979; 20: 2037-62.; (ii) Botts J, Sterman GF. Hard elastic scattering in QCD Leading behavior Nucl Phys B 1989; 325: 62-124.; (iii) Li HN, Sterman GF. The Perturbative pion form-factor with Sudakov suppression Nucl Phys B 1992; 381: 129-40.; (iv) Contopanagos H, Laenen E, Sterman GF. Sudakov factorization and resummation Nucl Phys B 1997; 484: 303-.; (v) Stefanis NG, Schroers W, Kim HC. Analytic coupling and Sudakov effects in exclusive processes Pion and ?*?? ?° form-factors Eur Phys J C 2000; 18: 137-56.; (vi) Korchemsky GP. Sudakov Form-factor in QCD Phys Lett B 1989; 220: 629-39.; (vii) Mueller AH, Xiao BW, Yuan F. Sudakov double logarithms resummation in hard processes in small-x saturation formalism Phys Rev D 2013; 88: 114010-0. Bakulev AP, Mikhailov SV, Pimikov AV, Stefanis NG. Empha-sizing the different trends of the existing data for the ?*?? ?° transition form factor Acta Phys Polon Supp 2013; 6: 137-44. Musatov IV, Radyushkin AV. Transverse momentum and Sudakov effects in exclusive QCD processes ?*?? ?° form-factor Phys Rev D 1997; 56: 2713-35. (i) Li HN, Sterman GF. The Perturbative pion form-factor with Sudakov suppression Nucl Phys B 1992; 381: 129-40.; (ii) Jakob R, Kroll P. The Pion form-factor Sudakov suppressions and intrinsic transverse momentum Phys Lett B 1993; 315: 463-70.; (iii) Gousset T, Pire B. Timelike form-factors at high-energy Phys Rev D 1995; 51: 15-24.; (iv) Stefanis NG, Schroers W, Kim HC. Analytic coupling and Sudakov effects in excluisve processes Pion and ?*?? ?° form-factors Eur Phys J C 2000; 18: 137-56.; (iv) Braun VM, Khodjamirian A, Maul M. Pion form-factor in QCD at intermediate momentum transfers Phys Rev D 2000; 61: 73004-38.